In a couple of weeks we will celebrate the 10th Anniversary of Twitter. That once blurry, unfamiliar space for sharing ideas has flourished into a terrific resource for information – especially for teachers. I have worked in my current school district for 11 years, since before Twitter existed. In that time, the district-driven professional development for teachers has changed only slightly. The state still decides the number of PD days districts need and officials have allotted time for individual buildings to decide how to use predetermined time increments. Still, this “sit and get” approach fails to put growth in the hands of the teachers. What makes memes so funny? They speak truth. With major advancements in technology and communication methods, it’s time districts look to reevaluate professional development strategies. There is always talk about “elevating the teaching profession” or “respect for teachers”, but the current model of professional development falls well short of those sentiments. District leaders should trust that teachers want to improve their instructional practices. To show that trust, leaders should look at self-directed professional development. 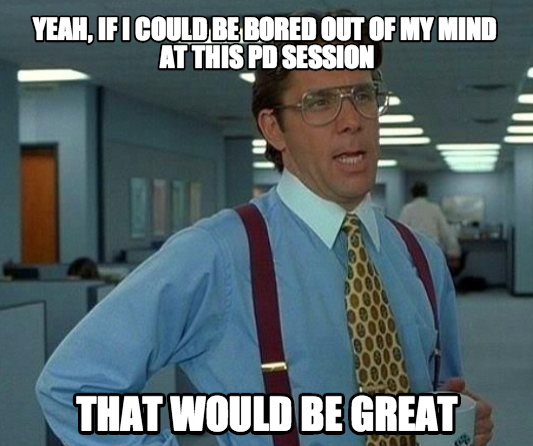 Self-directed PD would be a pretty big shift from our current paradigm, where attendance is taken at all events and strict accountability strategies are in place. However, I always go back to the phrase I heard about academic rigor in the classroom “If a student can simply copy answers, is the skill being assessed really valuable?” So I ask, “If a teacher can gain the information through other means (email, media, etc.) is the PD really valuable?” The most successful PD has been described as continual and content-specific, with time for implementation and support. This model could be achieved by allowing teachers to search out their own growth via any number of sources, while still providing district support for the teacher when necessary. Again, this requires trusting that teachers are intrinsically motivated to improve in their professional practice. Let’s use technology integration strategies as an example. In a survey by Samsung, 90 percent of teachers believe technology integration has a strong impact on student achievement. However, two-thirds of these teachers think they are not adequately trained to effectively implement new technology. 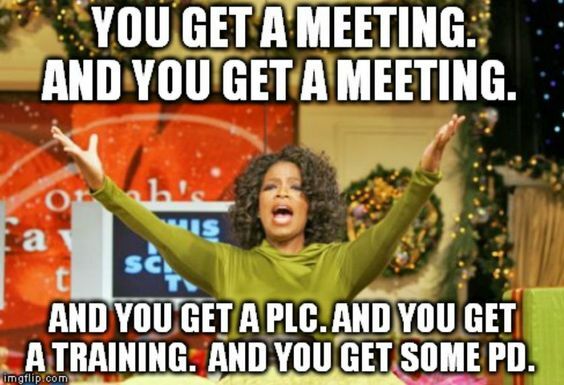 My district, West Fargo Schools, has tinkered with alternative methods for improving teaching effectiveness and varying professional development experiences. We have allowed master teachers in our buildings to share best practices, incorporated walkthroughs to see other environments, visited community businesses and collaborated through Professional Learning Communities. Those are great strides from the large blocks of meetings we would sit in a decade ago. However, these strategies are still restrictive in the fact that they assume professional learning only takes place on those designated days with those activities. In this Freakanomics podcast, Dave Levin, a former teacher and co-founder of the KIPP schools (Knowledge Is Power Program) says “…we are not training teachers right now to meet the challenges of our kids today. Right? So to this extent we are sort of still training teachers for classrooms of the past. So we’re not teaching teachers well enough how to effectively differentiate for the vast range of skills the kids have. We’re not teaching teachers effectively enough how to use technology to further teaching, and we’re not teaching teachers how to make school relevant for what kids are really needing to succeed in the colleges they may go to or the careers they may pursue 20 years from now.” My district prides itself on the varied learning opportunities provided to students (AP, dual credit, STEM, AVID, intervention, etc.) and rightfully so, these are great programs to help achieve academic growth. It’s interesting that the same avenue has not been provided to teachers. The “one size fits all” model restricts growth. Self-direct PD would also be more cost effective for school districts. 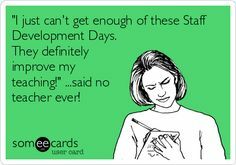 Professional development is an expensive line item for most districts. The 50 largest districts in the country spend $8 billion annually on PD. Eric Schulzke (@eschulzke) explains how the current model of PD is widely excepted nationwide, but shows little improvement in student achievement. The lack of results would be why my district has tried multiple PD methods in the last decade, all different variations of the “sit and get” approach. It’s time to let teachers drive their own learning. Authors @Myers_Berkowicz provide a variety of resources for teachers who are seeking to independently continue their professional growth. It’s time districts allow teachers to seek out their own learning opportunities instead of continuing the “one size fits all” approach. Growth would be driven by teachers’ instructional needs rather than district initiatives. Introduction: This post was written on August 17, 2013. It was originally intended to be posted that week. However, events transpired that made it difficult to publicize a post with a theme centered on compassion toward students. Since two and a half years have passed, the topic of this post has caused me much reflection. I will post the original post as intended, but I will include editorial comments in italics. As the next post on this new adventure called blogging, I would like to spend it as many educators do – looking to the year ahead, full of possibilities and excitement. Personally, I have a couple of new classes on my plate this year, which have me delving into new curriculum and scanning the worldwide web for new resources to help enhance my students’ learning experiences. However, it wasn’t until last night that I came to realize the one key ingredient for every successful classroom. As teachers, the content comes easy for us. We have a passion for our subject area and we want to share that passion with our students. Last night, I attended the wedding of a former student and it was the second wedding this summer that involved former students (I know I’m getting old-but that is for another post). This particular wedding was different – not in the expected way such an event separates itself from the rest. No, this wedding was held in the same church where I had attended a funeral eight months prior for a current student who passed away during the school year. These two events, although common in their location, obviously reside at opposite ends of the emotional spectrum. Last night, I found myself reflecting on another, more abstract, factor they had in common. As I sat and witnessed these former students express their devotion for each other, I couldn’t help but notice the immense love that transpired throughout the room. It was obvious that each person there cared deeply for this couple and each person wanted the best for them. This was not unlike the other occasion, where the same room, which was standing room only, was filled with individuals who cared deeply for the deceased. That common factor of deep, unwavering affection slightly surprised me. I wasn’t expecting to draw such a similarity between two drastically different occasions. It helped me to reflect on the connection I had with each of these students. The importance of developing a strong relationship with students started to become clear. Since this post, a colleague of mine has described this investment in student learning as emotional currency. Teachers often are deficit spending when it comes to their emotional investment in students. Creating a balance becomes essential, but it is difficult to maintain. As the school year begins, I will not only search for ways to make the content come alive for my students, but I’ll make an effort to make sure each student in my classroom understands the passion I have for them. This post, although written years ago, has been difficult for me to publicize. 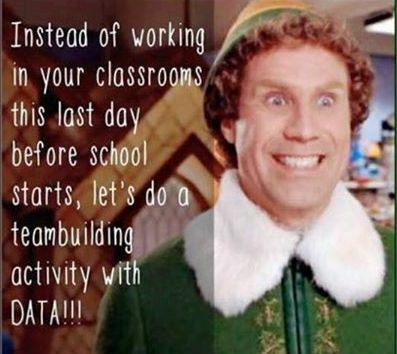 The time that has passed since I have written this has forced me to reevaluate my commitment to my students. My philosophy centers on student growth and preparing students for their next step. However, I have realized that it’s impossible for me to perform my job without giving my full commitment to my students. The most enjoyable part of my role as a co-curricular adviser is the opportunity for students to participate in the publications program for multiple years. It is different than a traditional class. Throughout their time in publications, I can witness them grow as young adults and journalists, but also as human beings. This extended time together allows me to become more familiar with them and their families. They also become extremely familiar with me and my family. This unique connection is what has made this past 20 months the most difficult of my professional career. As students graduate and move on from my co-curricular programs, it is my deepest hope that they not only gather the skills necessary to be a multimedia journalist, but they also gain an understanding of how to function ethically and morally in their future communities. I try to model these skills for my students, even supporting their right to free expression to the point of being fired. In the publications classroom, we call ourselves a family. We commit to each other every year and it is always my hope that the bond never fades. At this student’s graduation party in 2009, a parent told me that if it wasn’t for my publications class, the graduating student would have dropped out long ago. There was a bond within that publications environment that tied everyone together. That’s what made this message so difficult for me to read. Aside from the fact that this student takes aim at my daughters, it crushes me to think this student believes I would express anything but the truth. Whether they are aware of it or not, by believing the accuser’s allegations, former students are indirectly calling me a liar. The accuser’s allegations, which were not specific until long after the investigation, involve situations where I was present. The most difficult aspect of the past year has been dealing with this mistrust. 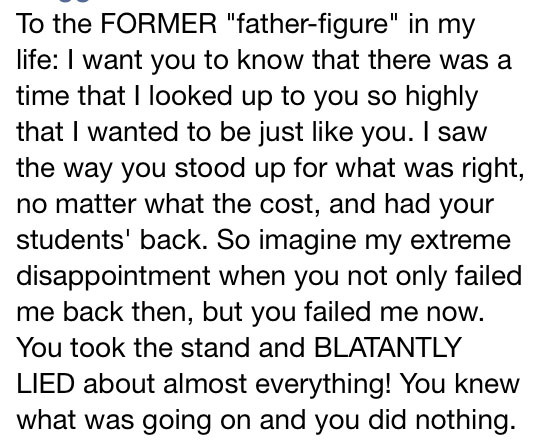 It was difficult for me to understand why former students would suddenly assume I would turn my back on my moral code. Recently a colleague of mine shared a quote from renowned astrophysicist Neil deGrasse Tyson, “One of the biggest problems with the world today is that we have large groups of people who will accept whatever they hear on the grapevine, just because it suits their worldview – not because it is actually true or because they have evidence to support it. The really striking thing is that it would not take much effort to establish validity in most of these cases…but people prefer reassurance to research.” My students’ worldviews have changed since they were in my classroom and that has made it easier for them to consider me a “mysogynist”. This worldview concept is evident in other former students’ discussions regarding this situation. To me, the sad reality is no amount of fact-based information will sway these perspectives. In fact, as someone responded on a previous post, “It is extremely important for me as an ally to stand with the women who have been violated in any way.” As a teacher, it’s hard not to stand up and clap for this former student’s convictions. However, it is also extremely disheartening that these convictions grasp so tightly to a skewed worldview and are void of the “research” deGrasse Tyson mentions. A friend and supporter of the accuser posted this article on a social media site. The lines that speak to deGrasse Tyson’s philosophy include, “Many, many, many of your opinions will turn out to be uninformed or just flat out wrong. No, the fact that you believed it doesn’t make it any more valid or worthwhile, and nobody owes your viewpoint any respect simply because it is yours. You can be wrong or ignorant. It will happen. Reality does not care about your feelings.” It hurts that some of my students, who prided themselves on fairness, truth and accuracy in my classroom, would think I would stray from those same core values. I am proud of them for expressing their strong “feelings”, but disheartened that these feelings ignore the truth and “reality” they were taught to pursue. It has been an emotional 20 months for me as I have reflected on my role in the classroom. These last few posts about this situation have provided me a means to share those thoughts. Moving into the new school year, I will return to my original intent of starting this site: to share my efforts, successes and failures in the ELA classroom. As the year begins, it will be a little harder to form that “family bond” we know so well in the publications environment. It takes time and effort to develop strong trust in these relationships. Knowing that an altered worldview can easily break that trust has been the most disheartening realization. Stay tuned for: “The bottom line: Compassion” Editor’s note: This was going to be the next post after my post on August 8, 2014 until the last year caused me to reflect upon my profession. I believe in justice. Ever since I was little, I have always rooted for justice. It provides me with a sense of peace knowing justice has been served. Not only that, but when I see injustice it burns deep and affects all areas of my life. In my 10-year career and even before as a professional journalist, I have seen and experienced injustice. I was unfairly removed as newspaper adviser in 2009, seen a coach removed from a long-held position with little explanation, seen the teacher’s union avoid involvement in a member’s nightmare and witnessed questionable decisions pass over administrative desks, just to name a few. After the July 27th meeting where the WFPS School Board reinstated Aaron Knodel with back pay, I have never been more proud to be a member of the WFPS district. District officials took matters into their own hands and conducted a thorough investigation.The list of documents and interviews reviewed by district personnel was impressive. Completing their due diligence allowed them to see all aspects of this unfortunate situation and come to the correct conclusion. State officials who pursued these criminal complaints received a strong message from the district’s decision. After two independent investigations reviewed the information related to this case, it should be more clear than ever that the state acted inappropriately. The incomplete investigation and lack of substantial evidence should never have led to five criminal complaints. It is time the public starts asking the same questions jurors asked after the completion of the trial. One juror even questioned on the Joel Heitkamp Show how the state could put somebody through this with what they had and another juror on the Sandy Buttweiler Show noticed several discrepencies throughout the trial. It’s sad these issues are not being addressed by state officials. The public response to the district’s decision was as expected. From online discussion threads, it seemed as though the majority of opinions were favorable. What surprises me is public opinion has swayed from the original discussion of criminal charges. Even my former students, who I would have hoped through my courses have learned to evaluate information in its entirety before reaching conclusions, have responded with negative and threatening comments toward myself and my family (the topic of my next and final post on the experiences of this past year). Even local radio hosts have noticed how public opinion has shifted, but people are still missing the fact that the original charges were brought forward by state officials in a damaging and irresponsible manner. The public comments that are not favorable toward the district decision do not even reference the original investigation or complaints. They are mainly focused on student communication, which has already been addressed. It is disheartening to see the majority of people ignore the original complaints because they are focused on communication times and volume. I have already explained how this isn’t uncommon and Superintendent Dr. David Flowers mentioned the district mentoring initiative at the meeting. It is sad to see non-teachers struggle with this concept and ignore the larger issue: how five separate criminal complaints could be filed with no compelling evidence. People are ignoring the fact that these communication statistics were taken out of context and combined with other faulty investigative methods to legitimize the criminal complaints. Those complaints cost a well-respected teacher his reputation and state taxpayers hundreds of thousands of dollars. Assistant Attorney General Jonathan Byers spared no expense during the trial process, even flying a private jet to Fargo for a deposition. In addition, BCI Agent Mike Ness enjoyed spending taxpayer dollars when he tested the “Twilight” book for DNA in more than a hundred places (listen at 30-minute mark here), only to have all results return as negative – proving definitively that Aaron never touched the book or sticky notes he supposedly wrote and yet state officials still proceeded with that evidence accompanied with the five charges. It is time these individuals are held accountable for their actions. It has been documented that BCI agents operate with some immunity and after this series of events it’s easy to see it is time for a change. The WFPS district officials made a strong statement to state officials Monday night and restored my faith in justice. It’s time the public turns the focus on the main issue. It is obvious from various dialogues that we hold teachers to the highest possible standard; we should expect no less from our state officials. The annual North Dakota Council of Teachers of English conference in Mandan this week provided ND English teachers the opportunity to collaborate and reflect on their profession. One of the sessions involved discussing a Young Adult Literature text in small groups. The book, Period 8 by Chris Crutcher, is popular among young readers. It provided teachers a unique discussion about possible teaching strategies and literary strengths/weaknesses. The novel centers around a group of high school students who attend a voluntary open period during their lunch hour, which is called period 8. This group is led by Mr. Logsdon, a teacher at the end of his career who develops strong, open relationships with each student in his room. His rapport with students is so strong that he works out with them, texts them, calls them and they feel comfortable stopping by his house at random hours when they are distressed. He plays a vital role in helping students find safety from destructive environments. It is this behavior that led discussion participants to decide whether or not Logsdon is an effective teacher. Everyone agreed that his strong relationships with students made him a great teacher. In fact, one ND English teacher explained that the most effective teachers are those who have strong student relationships. West Fargo officials also recognized this during the 2008-2010 school years and encouraged “Relationships” as one of the BIG 5 components to the staff’s educational philosophy. Recently, the process of developing and maintaining strong student relationships has come into question. With the recent false accusations against Aaron Knodel that led to a faulty investigation, five criminal complaints, a trial and possible reinstatement, the discussion of student communication remains the focal point. The WFPS School Board and Superintendent Dr. David Flowers emphasized this in his statement July 13th. He said, “Our focus is on questions of behavior and judgement, and whether any ethical lines were crossed that would cause us concern or influence recommendations regarding Mr. Knodel’s employment in the district.” The fact that Aaron was exonerated from the false accusations will play no role in his reinstatement. Officials are evaluating his communication with a student and whether “ethical lines were crossed.” The only statistics available from this communication is the number of calls/texts sent and received and the communication time. The final district decision is on the agenda for the July 27th board meeting and my next post will reflect on that decision. As a teacher and a co-curricular coach, the concept of evaluating ethical boundaries based on communication volume and communication times is deeply concerning. I have hundreds of communications with various students through various media (texting, voice calls, Snapchat, Twitter) each school year. This conversation refers to the day we were taking our group photos. I could not attend school due to illness. Notice the candid language used by this student. 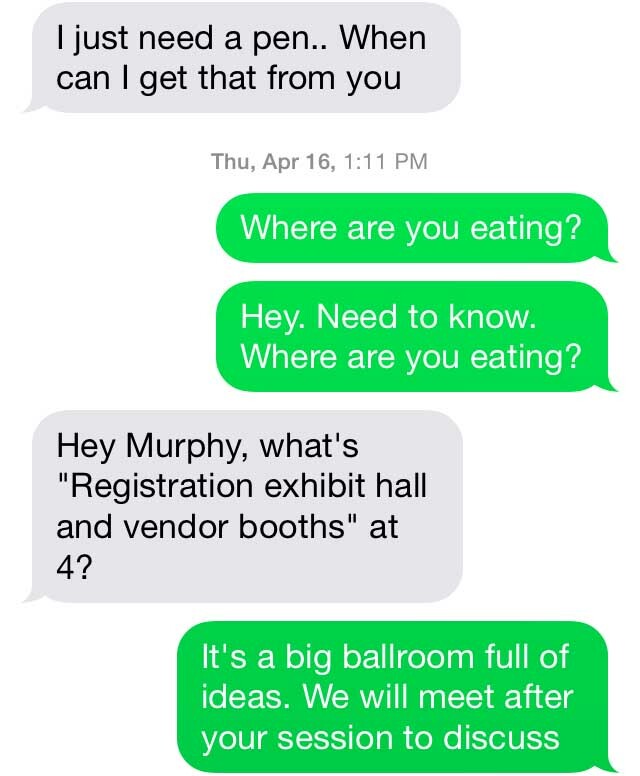 Here is another text conversation from the national journalism convention trip last spring in Denver. I require students to text me back immediately so I’m constantly aware of their whereabouts. The two eating location requests were accompanied by several phone calls so I could check on the student. This text conversation was last month during yearbook camp. Students had an 11 p.m. curfew, but chose to stay up in their rooms and work on their yearbook projects. I offered assistance via text messages. Notice the times of these texts. This assistance continued for another half an hour. If an outsider evaluated my communication volume and time period without content, the perception of my communication could be skewed if accompanied with false accusations. Even as Aaron was exonerated from the criminal complaints, the public remained focused on the volume and time periods of communication discussed during the trial process. 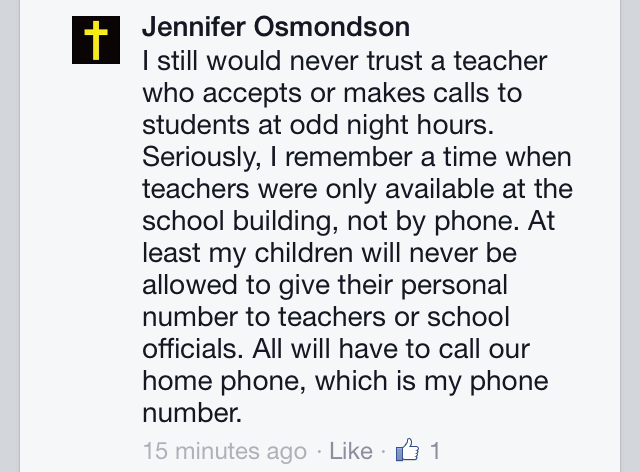 These comments concern me because of the role today’s teacher plays in a student’s life. Effective teachers no longer limit communication to classroom direct instruction. Understanding the various methods for extending instruction beyond the classroom differs between digital immigrants and digital natives. This article suggests that the former struggles understanding the communication methods of the latter. (Sidenote: The article also discusses how companies are creating a CXO – Chief Experience Officer, to guide customers’ experiences. A perfect example of how teachers need to prepare students for positions that do not currently exist) Properly preparing students for success is nearly impossible without expanding learning and communication beyond the classroom walls. The agents at the North Dakota Bureau of Criminal Investigation simply focused on times and call volume without the content. (Sidenote: former Towner County Sheriff Vaughn Klier said BCI agents “…think they’re above the law.”) BCI agents used the communication volume statistics, in addition to the misinterpreted colleague comments and the unqualified hand writing analysis, to make the accusations against Aaron seem legitimate. Now that those accusations have been proven false, the fact that district officials and public perception see a specific volume and time frame of student communication as possibly unethical without knowing the content concerns me. As a dedicated, passionate educator who wants to give students every opportunity to find success, it is difficult for me to see perception skewed over the volume and time of student communication. It seems as though teachers might have to choose between assisting students, who are digital natives, through various modes of communication or maintaining strict communication policies, possibly weakening student rapport and losing effectiveness along the way. That is a sad reality. It was not until this last year that I realized teachers’ careers are more vulnerable than ever. We are placed in a position to help students develop in a variety of areas: academically, socially, physically and mentally. The best teachers set clear expectations in all of these areas and push students to reach those standards. When students slip in any of the areas, teachers feel it is their responsibility to provide students with the scaffolding and support to help them reach success. In August 2014, this philosophy on supporting students was shaken. Five felony charges were filed against my colleague Aaron Knodel, from which he has since been exonerated. Tonight, West Fargo Superintendent Dr. David Flowers said the district accepts that Aaron is exonerated, but they will evaluate whether “any ethical lines were crossed” before he is reinstated. This comment strongly relates to my next post about student communication and the roles teachers have in today’s classroom, but it also shows teaching is not a safe job. After false accusations lead to a nightmare 17-months for a highly decorated teacher/coach, the fact that he was acquitted does not even factor into his reinstatement. This should concern all North Dakota teachers. I have already written about the delicate position people are in when discussing these false accusations and who should be considered ultimately responsible for filing them. Understanding the vulnerability of the teaching position makes completing daily responsibilities a struggle for a dedicated, compassionate teacher. In college, professors address proper ways to avoid any possibility of issues when it comes to working with students. They address using the counselors for support, telling a colleague, leaving a door open, keeping accurate records, etc. However, even with these precautions, nothing can protect a person from an unethical investigation. The methods used by the Bureau of Criminal Investigation and special agent Mike Ness forces all teachers to reconsider how much they will help struggling students. No teacher is safe. The only other colleague who was interviewed by BCI agent Ness in March 2014 was asked questions regarding the allegations that Aaron received a ride from the accuser and “blew him off” when he asked about it. The colleague said it did not occur and he would have reported it if it had occurred. In the actual police report, it doesn’t state the colleague’s name but says he “saw the student driving Knodel home and questioned him about it.” These two statements are drastically different. This discrepancy threatens all teachers. Even with the greatest of precautions, there is no hope for teachers when an investigator ignores fellow colleagues’ accounts of a situation. A professional handwriting analyst for 34 years, Janis Seedstrom Tweedy said “I can state unequivocally that Special Agent Troy Kelly has insufficient education, training and experience to be recognized within the QDE community as a competent expert Questioned Document Examiner”. Kelly’s experience is compared to “…reading law books for 5 days, instead of 3 years of law school, and purporting to have the knowledge and skill necessary to represent clients as an attorney.” The unethical methods used by Ness to create five separate criminal complaints against Aaron should alarm teachers across the state. The fact that false accusations can lead to charges is scary enough, but there is also a large probability of going to trial. Jeff Bredahl, a defense attorney for Bredahl and Associates in Fargo, pointed out on a morning radio program that “weak cases” are more likely to extend all the way through the trial process. So not only should teachers be concerned that false accusations could lead to charges, but that it would be likely to continue all the way to trial. The negative publicity and cost of this process is damaging enough, but as WFPS School Board members showed tonight, not even being exonerated from a “weak case” will allow a teacher to possibly remain employed. All methods college professors describe to “protect” a teacher from false accusations are not enough. There is no strategy that can protect a compassionate, dedicated teacher against an investigator who ignores the truth. I’m going to be honest, one of my weaknesses is always believing the best in everyone. Students in my classroom hear me repeatedly say, “Be better tomorrow than you were today.” I consider a student’s mistakes or missteps to be an honest attempt at finding success – and sometimes my faith in humanity burns me. In my time in the classroom, I have come to accept being burned by students because they are still discovering their own path in the world, but I never expect to be burned by adults…especially adults investigating extremely serious claims against a teacher. However, throughout the 17-month ordeal my friend and colleague Aaron Knodel endured, my faith in the professional investigative process was extremely shaken. Previously, I wrote about the delicate balance of discussing false accusations and explained that Bureau of Criminal Investigation agent Mike Ness should be held responsible for all outcomes after these false accusations resulted in five felony charges against Aaron. I visited with agent Ness on two separate occasions, in February and March of 2014. I will never forget those interactions and the faith I lost in the system as a result. Before making arrangements for our meeting, Ness ordered me to remain silent. His exact words still ring in my ear, “I’ve charged people with contempt for a lot less.” (Sidenote: I found out later his threat had no legal weight). I was speechless. My friend and colleague was being investigated – a worst-nightmare scenario for all teachers. I wanted to meet and cooperate with Ness immediately so he could start searching for the truth and end this nightmare for Aaron. My faith in the process and my naïve optimism for human goodness ultimately failed me. Ness never attempted to find the truth. In fact, he only interviewed two professional colleagues – and he only asked questions about a portion of one of the five charges. Ness never accepted any of the recommendations I offered for people to interview. I suggested talking to other teachers (one co-teacher was in Aaron’s room every day). I gave names of students who would be able to help him find the truth. He never interviewed Aaron, his wife, other teachers, past students (except the accuser’s friends), babysitters, daycare providers, counselors, administrators, etc. I was extremely cooperative and willing to offer any information that I had because I was confident once Ness found the truth he would realize the allegations were false. Here is the problem: Ness was never concerned with verifying the claims – he only wanted to find enough information to file charges. He never questioned me about any specific allegations. Any specific references would have made it easy to find information to help him. 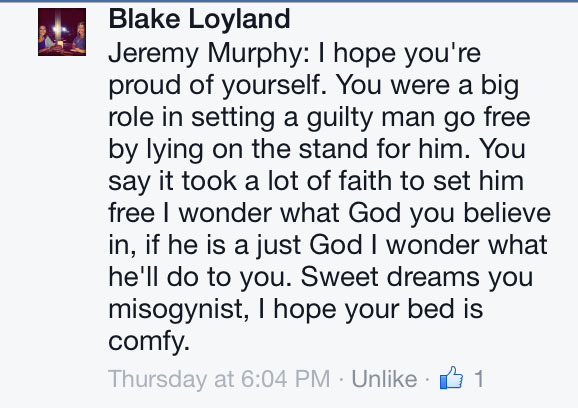 He only vaguely referenced sexual misconduct. Yet, the police report published in August states the accuser said she and Knodel had sexual contact in his West Fargo High School classroom on five to 10 occasions “before, during, and after school hours.” Ness never asked questions about specific times or dates. It wasn’t until the deposition of the accuser, one year after the investigation began, that she mentioned it was before school and during lunch. If Ness would have known these specific allegations during the investigation, I could have told him I ate lunch with Aaron every single day starting the second week of school. Every. Single. Day. I could have told him that finding privacy at WFHS is virtually impossible. Every department teacher has a key to your room and students are always entering/leaving. If he was truly searching for the truth to these accusations, I would have expected him to ask about the school environment and those specific time periods. Assistant Attorney General Jonathon Byers actually asked me in cross-examination why I didn’t offer this information about the school day to Ness during the investigation. My response, “He didn’t ask.” And after thinking about it, I don’t think he really knew what he was looking for at that time. There weren’t any specifics to the claims. He was searching for a way for her accusations to fit during the process of the investigation. It was never an attempt at finding truth, but finding enough to charge. Ness used unethical investigative methods to search for his charges. He used leading questions, misinterpreted interview responses, shifted word choice, intimidated participants and manipulated “expert” opinions. He asked his BCI colleague, Troy Kelly, to conduct the handwriting analysis. Kelly took a 27-hour course where the description specifically states successful completion does NOT qualify individuals to make expert opinions in legal cases. In my time teaching students investigative reporting strategies, these would all be covered under the unethical chapter. The other colleague interviewed is listed in the police report as the one who “saw the student driving Knodel home and questioned him about it. Knodel ‘blew it off’ and told the teacher it wasn’t the student.” However, after conversations with the colleague and reviewing the investigation documents, he never gave any kind of indication that this situation occurred. In fact, he denied it during the course of the interview. It was also never addressed during the trial. After time to reflect and examine Ness’s approach to this investigation, it is obvious to see he was never intent on finding the truth. After presenting his findings to the Grand Forks County prosecutor, they refused to pursue it. Ness took his information to Byers (in the same government office as BCI) and together they compiled the five criminal complaints against Aaron without the proper due diligence to verify the truth to those claims. Another private investigator logged numerous hours and actually completed a thorough investigation of individuals on both sides of the complaints. He left this message with the defendant, “I have submitted my final bill as you can see there is no charge, consider this my contribution to a man who was wrongfully accused and did not deserve what happened.” Given the facts presented during trial it is easy to see Ness was never intent on performing a complete investigation into these extremely serious accusations. 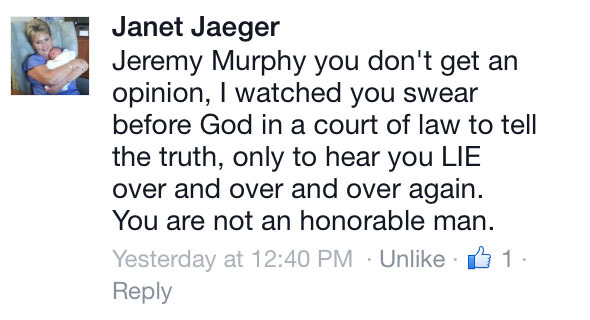 If he would have sought the truth, charges would never have been filed. My involvement in this investigation has left me less optimistic in the professional standard of others. The day I received the call from Ness I thought all professionals do their best to uphold the standards of their profession to the best of their ability. Special agent Mike Ness proved to me that the system is only as strong as the people working within it, and our system is weak. In my classroom I will try to continue to hold students to a higher standard with hopes that they will move beyond my classroom and become ethical, responsible professionals to correct the system.